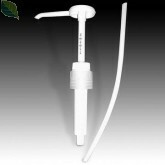 This Heavy Duty, High Speed 55 Gallon Siphon Style Siphon Drum Pump is perfectly suited to heavy duty dispensing of our Green Cleaning Solutions. This Heavy Duty Drum Pump is made of light weight, non corrosive, non-toxic plastic material. This Drum Pump can be used to pump Drinking Water, Petroleum products, light oils, kerosene, diesel oils, toluene, deodorants, corrosives, chemical Insecticides, soaps, detergents, mild acids, anti-freeze, liquid waxes, thinner, gasoline, water, and more. Please DO NOT use this pump for transferring the following liquids : ACETON, BENZEN, CREOSOL, ETHYL, PHENOL, ETHYL ETHYLE, Concentrated CAUSTIC SODA LIQUID, NITRIC ACID, HYDROCHLORIC ACID, SULFURIC ACID, etc.